Join us in Early June getting the garden in. Learn about soil, start seeds, transplant, and plant. Gain skills to plan ahead for your own kitchen garden. Have fun getting your hands dirty! Learn to work with what you have, and help the garden take shape. Dive into the Alaskan Wilderness! Gain skills in identifying wild plants. Discover food and medicine that the landscape provides. 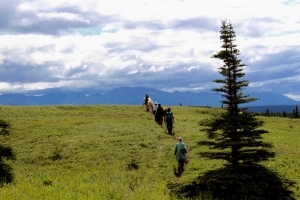 Hike to different habitat and learn about plants in each area. Gather plant material, bring it back to the homestead and utilize as food and create medicinal preparations. Includes a Summer Solstice celebration! Women in Wilderness. Hit the trail with well-traveled all female Alaskan guides. Experienced backpackers and guides Margaret Stern and Caity Potter take you on their favorite route into the foothills of the Alaska Range. Through the woods, over upland tundra, to river bottoms and alpine meadows, experience the Alaskan wilderness while forging friendships to last a lifetime. Spend a day learning the finer points of hanging and sharpening your own axe. Take your newly made tool, and assist in building a round pen for training our Icelandic Horses. Food, Lodging, Guided Hikes, and Transportation Included. Join us for blueberry picking under the gaze of the Alaska Range. This time of year, wildlife are on the move! Bring your binoculars for glassing for charismatic caribou. Learn about the habits of our Northern fauna and wild plants. Bring your berries back to the homestead. Make your own blueberry jam and liqueurs to bring home. May 2019: We are teaming up with talented herbalist Morgan Ross for one spring edible & medicinal plant weekend in May of 2019. Fiddlehead collecting, salve making, birch tree tapping. Dates TBD. September 2019: We are excited to team up with our friends at Talkeetna 4×4 Adventures for salmon & small game hunting on the road system during September of 2019. Check back in April for finalized dates! We have heard the requests, and are now offering month-long internships at the Homestead. Interns learn about all aspects of homestead life: from gardening, construction, animal care, and food. All interns are welcome to take part in events and workshops we have on the homestead, and are expected to take ownership of one project of their choosing. Must be self-starters with wilderness experience. WFR preferred. Cost: $1500 for one month of lodging, food, and transportation.